The result of the once distinct fields of media, entertainment and technology are converging and becoming something far greater than the sum of their parts. That’s The M.E.T. Effect℠ — and it’s redesigning the very nature of how we live, work and play. This cultural phenomenon is fueled by internet connectivity and integrated systems, opening up limitless opportunities. Behavior and business have merged to redefine workflows and revenue streams. Corporate alliances are forming and development teams are working vigorously to fill consumer demand for more digital content and immersive experiences. NAB Show® is where global visionaries convene and where this phenomenon comes to life. The entire digital ecosystem attends the Show, including Broadcast, Digital Media, Film, Entertainment, Telecom, Post-Production, Academia, Mobile, Advertising, Security, Sports, Live Events, Online Video, IT, Virtual and Augmented Reality, and so many more. 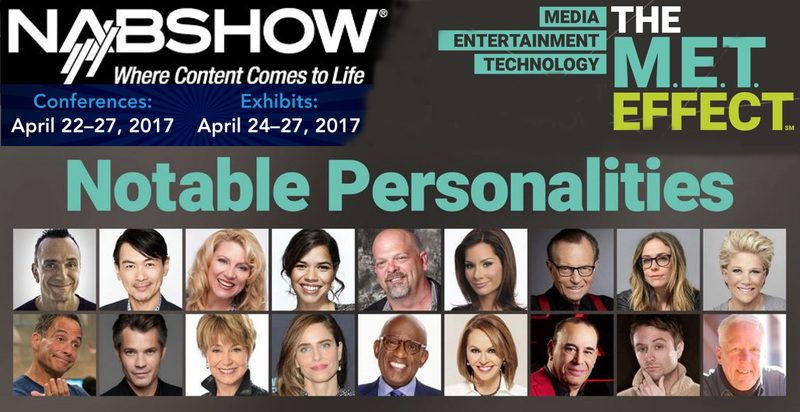 As of today we feature 48 companies and their approach at NAB2017 Show. This list is continously updated until NAB2017 opens on 24 April at the Las Vegas Convention Center. The new 32-camera triple-expanding truck will deliver 4K HDR uncompressed broadcasts, using SAM IP infrastructure, a production switcher and multiviewer, Sony 4K cameras and EVS servers – all controlled and monitored by Axon’s Cerebrum platform via a single fully customisable user interface. The vehicle will also feature a range of Axon 4K infrastructure products and hardware panels. Timeline Television’s decision to install a Cerebrum system in the new vehicle is based on previous good experience with Axon technology. The company already uses Cerebrum in its main UK broadcast centre to control all the equipment in its programme chain. It has also installed Cerebrum across its fleet of OB trucks and flyaway kits, citing functionality and easy-to-use interfaces as the main reasons for its choice. Game Creek Video serves the world’s largest television networks, production companies, and news organizations with state of the art mobile television production units. We combine an advanced, modern fleet of mobile production units with an accomplished, reliable team of experts to ensure that the largest events in the world are televised flawlessly, including events such as NFL Super Bowl, MLB World Series, NASCAR, The U.S. Open Golf, and FIS World Ski Championships. For clients requiring dependable technology, exceptional response time, and consistent quality results in high-pressure environments, Game Creek Video delivers award-winning productions of sporting events, concerts, awards ceremonies, corporate events, and more. Nitro offers a Grass Valley Kayenne K-Frame, a Calrec Artemis Audio Boards and Sony Cameras. Using the VSM System gives Mediacorp a high level of failure safety through its sophisticated redundancy, supporting its flexibility, workflow management and the time savings made in program preparation. The Mediacorp studio complex is divided into four sections: Central, Radio, TV and News. The Central section is further subdivided in three areas: CMX (Ingest), DC (Distribution/Contribution) and Playout. The Distribution/Contribution section uses VSM’s Virtual Package Workflow to allow an actual incoming source (from OBs or downlinks) to become a virtual source and made available as such throughout the facility. If one device in the signal chain fails, the virtual signal is uninterrupted, leaving the signal flow intact while the device is switched or changed. The flagship news show The Young Turks—co-hosted by The Young Turks Founder and CEO Cenk Uygur and Ana Kasparian—consistently ranks No. 1 among comScore rankings. As a pioneer of subscription-based membership, TYT Network currently provides special, exclusive content on TYTNetwork.com to its vast membership. “Our goal is to continue expanding the scope of our programming and distribution channels, as well as finding more effective ways to monetize it. To accomplish this, we needed to stop relying on a hodge-podge of generic automation software that posed multiple points of failure across our system. We switched to Vantage because it’s purpose-built to support the needs of a high throughput media processing operation like ours,” explains Jonny Greenwald, Post-production Technical Director for TYT Network. Founded in 2012 by talk radio personality and entrepreneur Glenn Beck, TheBlaze is a multi-platform news and entertainment network available on television, radio and the internet. TheBlaze is carried by over 100 television providers, with eleven of those being in the top 25 nationwide. "We are delighted to see TheBlaze joining the rapidly expanding number of major broadcasters choosing Octopus 8 as their core newsroom system," adds Gene Sudduth, Octopus Newsroom national sales director – North America. "Octopus 8 will provide direct script text feeds to the studio teleprompters, allowing news presenters at TheBlaze to deliver up-to-the-minute news stories. For the first time a TV live broadcast of a Bundesliga football match was produced entirely in the format UHD-HDR (Four more tests are scheduled between now and the end of the current football season). TVN MOBILE PRODUCTION produced the match Borussia Mönchengladbach – RB Leipzig using new Sony switcher and HDR converter technology and a unique new HDR / SDR workflow. The match was produced in HD and UHD and also in HDR (High Dynamic Range). This was made possible by an HDR / SDR (Standard Dynamic Range) workflow specially developed for the production with one OBVan. The whole scenario was based on a hybrid production concept, where the HD workflow was never affected by the UHD signal. Since UHD is not down converted to HD, the quality of the HD signal is never reduced. The broadcasting security and the constant quality of all provided signals were ensured any time. The English Premier League has extended its contract to use ChyronHego's award-winning TRACAB™ image-based tracking system across the entire league. TRACAB will continue to deliver real-time ball- and player-tracking data and enable powerful insight into match play for all 20 Premier League clubs over the 2016/2017, 2017/2018, and 2018/2019 seasons, at 380 matches per season. "The Premier League has been using TRACAB to bring a new dimension to its live football coverage since 2013. The League's decision to extend our partnership for another three years is a great testament to TRACAB's unmatched power and advanced capabilities," said Jon Roberts, U.K. managing director, ChyronHego. "The choice of major sports organizations throughout Europe and the Americas, TRACAB is the most advanced camera-based player- and ball-tracking system on the market." A team from Riedel Communications Switzerland AG planned, installed, and operated the radio network. Working with the Alpine World Ski Championships' local organizing committee, the Riedel team designed a digital, redundant radio network that provided a base for reliable communications among 30 different user groups with full connection to the Riedel Artist intercom. Over 600 radios for timing, race management, security, logistics, and production were handed out to the local event organization. A customized CCTV application allowed engineers to monitor the relay stations installed at St. Moritz simply and conveniently for optimal radio coverage. "A holistic and reliable communications infrastructure is absolutely indispensable to the success of this event," said Franco Giovanoli, CEO and Director of the FIS Alpine World Ski Championships. The 2017 Ultra Miami dance music festival drew a diverse line-up and some of the biggest international DJs and producers to the Bayfront Park site in downtown Miami, transforming it from a cool shorefront public space to a pleasure dome for around 150,000 electronic music fans for the weekend, enjoying the warmth, good vibes and some amazing music. Robe moving lights were specified for four of the main performance areas – the Carl Cox & Friends Arena, Main Stage, Live Stage and Arcadia - the world’s favorite giant spider made from recycled industrial waste, which is newly lit with Robe after a major investment by Arcadia Spectacular. The production lighting design for the Carl Cox & Friends Arena was created by Steve Lieberman of SJ Lighting, celebrating 18 years in the Ultra Miami ‘hot seat’ … the festival is 20 years old next year! In the role of both lighting designer and technical supplier was Gareth Kays of GK Productions, Tasmania's leading performance technology consultancy. His brief was to create an impressive, Broadway-style production on a comparatively small stage. "One of my main challenges was disguising the ground support system which allowed lead character Elphaba to take flight during the number Defying Gravity," Kays explained. "I used Philips Showline SL BEAM 300fx moving head luminaires at full zoom for back lighting Elphaba as she rose into the air. Light radiated out from her, masking the mechanics and giving the impression she truly was flying. I used Philips Showline SL LEDSPOT 300 luminaires to light the downstage in a dappled gobo wash, which added to the radiating backlit look." Country music star Brantley Gilbert has launched The Devil Don’t Sleep tour playing arenas in North America through early spring in the first leg. Nathan Alves and Howard Jones co-designed the show, which features Claypaky Scenius, Mythos 2, Sharpy and Stormy Strobe fixtures. The tour supports Gilbert’s new album of the same name. Jones’ company, Nashville-based DCR, is supplying all of the show’s equipment; it has provided gear for Gilbert since before his first record deal. The tour marks Alves/Jones second collaboration for the artist. The Devil Don’t Sleep is a departure in design from Gilbert’s recent tours. An initial delivery of four lenses – ordered as soon as Canon announced the UJ27 at the IBC 2016 trade show in Amsterdam last September – is set to arrive in early April, adding to the company’s existing fleet of more than 300 broadcast lenses. ES Broadcast will also shortly be taking delivery of its first Canon UHD DIGISUPER 86 (UJ86x9.3B) lenses which, along with a large existing fleet of Canon UHD DIGISUPER 90 (UJ90x9B) lenses, will mean the company will be able to offer Canon’s full range of UHD studio and field lenses for hire. This latest acquisition of UHD lenses further cements ES Broadcast’s commitment to supporting UHD live production. The company already has one of the largest hire fleets of Sony HDC-4300 4K camera channels in the world. Through long partnerships with many different types of customers, Grass Valley, a Belden Brand, knows that every production facility has unique needs. That’s why the LDX 82 Series includes four upgradable camera models, offering varying levels of operational flexibility to match every production need. As the definitive HD camera covering all HD standards, each model of the LDX 82 offers the best sensitivity in all HD formats, including 1080p, a wide color gamut and Grass Valley’s XDR (Extended Dynamic Range) operations with a full 15 F-stops. Regardless of the model, the LDX 82 is Grass Valley’s best HD-only camera. Each LDX 82 camera model leverages the patented Xensium-FT CMOS imager which allows for better sensitivity, higher resolution and extended dynamic range. Wilhelm & Willhalm, the German event technology and installation specialists, recently invested in two Wings Engine RAW media servers, capable of playing out uncompressed content up to and beyond 4K. Since the founding of Wilhelm & Willhalm in 1991, the privately held company's comprehensive service portfolio and innovative AV solutions have been the foundation for their continued success. The planning and technical realisation of the award winning FC Bayern Munich's Erlebniswelt project established Wilhelm & Willhalm beyond the borders of Germany as one of Europe's leading service providers in the event and installation market. INSIGHT TV, the world’s largest producer and broadcaster of adventure travel and extreme sports genres in true, unscripted 4K UHD, has announced that it has completed production of its exciting new adventure game show Living Stone. The ten-part show, which was shot in Botswana, Africa will be shown in 4K UHD on INSIGHT TV’s SVOD service from 2nd April 2017 at 9.50pm, and on platforms including: Vodafone Portugal, Vodafone Spain, Swisscom and Tricolor all in UHD. Produced in partnership with Dutch television production company Strix Television, Living Stone takes five couples on a harrowing, life-changing adventure through Botswana’s beautiful landscape. Contestants hike through the toughest terrains and are constantly faced with the forces of nature: heavy thunderstorms, unbearable heat and daily encounters with wild animals. Immersive Live is EVS’ vision for the viewing experience of the future, where consumers can use any screen to engage with live content including UHD-4K, 360 degree, augmented and contextual replays. To shape this new viewing experience, EVS has developed an ecosystem of Connected Live technology and Creative Live tools. Connected Live is a fully integrated EVS-based ecosystem that enables users to build solid and future-proof IP production infrastructures and create new multi-site collaborative workflows. Open the Creative Live toolbox and you’ll find solutions that enable users to create the most compelling stories from any media source. A collaborative environment where users can efficiently bring together the highest quality live feeds, instant replays, archived media, data, graphics and user-generated video to deliver the richest, most creative live programming for today’s demanding audiences.